Ted Nugent brings “The Music Made Me Do It Again! Tour” to DTE Energy Music Theatre on Saturday, August 31 at 7:30 p.m.
Nugent started “beating on my first guitar around the age of five.” Strongly influenced by Chuck Berry and Bo Diddly, he knew he wanted to pursue that type of sound and attitude. Early bands, The Royal Highboys, and The Lourds, paved the way for the Amboy Dukes – and their psychedelic Journey to the Center of the Mind kicked Young Ted’s career into hyper drive. The axe maniac soon broke out as a solo artist, signing with the legendary Epic Records, where the guitarist’s prodigious talent, earshattering volume and over-the-top stage antics quickly earned him the moniker of Motor City Madman. Cranking out hits like “Cat Scratch Fever,” “Just What the Doctor Ordered,” “Free for All” and the iconic “Stranglehold,” Nugent garnered international acclaim and truly hit his stride, becoming the #1 Grossing Tour Act in the world. Nugent’s no-holds-barred career now spans six decades of multi-platinum hits. The ultimate Road Warrior, touring and recording continue at Nugent’s breakneck pace. 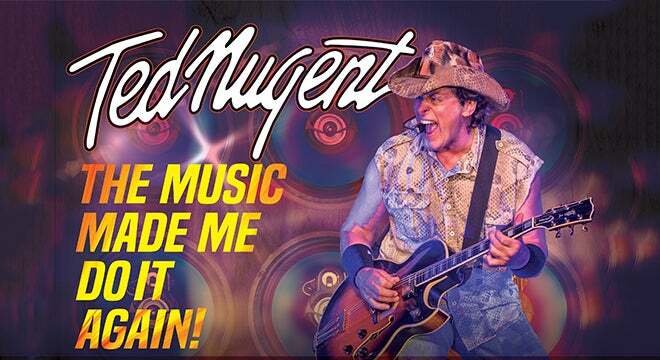 Nugent and his inimitable sound have been featured on VH1’s Behind the Music, A & E’s Biography and more. Nugent was named Detroit’s Greatest Guitar Player of All Time by readers of MLive. For more information, please visit www.tednugent.com and www.facebook.com/tednugent.